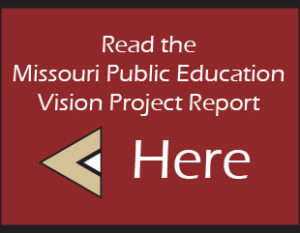 This joint effort involved school board members and school administrators across the state to develop a comprehensive vision for Missouri’s public schools. The Missouri School Boards’ Association and the Missouri Association of School Administrators represent those charged with legal responsibility for governance and executive leadership of Missouri public schools. The two groups each have developed positions for which we advocate each year, but the groups have not developed a comprehensive vision for public education. The shortfall of state and federal dollars has legislators and state leaders looking to our organizations for leadership and the financial support for public education likely will get worse before it gets better. In the absence of any vision and/or plan, proposals such as vouchers, open enrollment, tuition tax credits, etc. will be seen as alternatives. To build trust and support for public education. To create a unifying vision and transformational principles around which coalitions will form to change the education culture in the state. To provide guidance to local school districts as they develop strategic improvement plans for improving educational opportunities in their communities. To provide a world-class educational experience for all of Missouri’s students. To ensure our students are competitive in a global economy. There were seven groups that focused on specific areas related to public education in Missouri.